After he said that I just smiled at him and shook my head in belief. In his voice I heard echoes of resurrection and a Savior with scarred hands. As I was taking a bite of coleslaw and reflecting on his prayer, I thought of God setting my sins on fire, baptizing them, and sitting them next to me. Since then, I’ve thought of how the fire would burn up the bad, how the water that put them out would send the ashes to the grave, and as they were set beside me, all shiny and warm, I would remember that I’m loved and forgiven. But “sit them beside me” is not what Desmond said…he said “and sit them beside us…” The US is a big word here. It’s only two letters…but us is what we are taught to say in the prayer, and us is what a 4 year old has been able to build on. I think it is kind of easy to stand together and say “Forgive us of our trespasses…” but sitting beside each other as God sets our transformed trespasses beside us…well…that’s not everyone’s idea of a good time. Do you tell the story of your resurrection from the grave and the wounds that put you there? Believe it or not, some people dig scar stories. Ignore the wound part of the story and the scar is just a mass of new skin. Focus only on the wound and you’ll attract the wrong listeners. Tell the whole story and your listener will hear the gospel you carry with you. God can do amazing things with wounds…like inspiring belief in doubting hearts. …as we forgive those who trespass against us… The “those” should probably be in your story as well, they might be the ones that you need to tell the story to…Those “thoses” need you to be in their story. We will hurt and be hurt by people in community with us. “Those” wounds sting the most. I’m willing to say that I’ve been a “those” to others and to myself. I don’t believe I can call a trespass forgiven if I just pretend to forget and push it back into a void. Relationships are messy, but worth the clean up. Recently, a dear friend said to me that it must be nice to work in a place where you get fed spiritually. I acknowledged that I enjoy being able to help people. Then I responded back that it’s not all kittens and rainbows. The story of kittens and rainbows starts with moody pregnant cats and dark cloudy skies. Tuesday I had trouble with a customer. She required a lot of assistance and care, but that wasn’t the trouble…the trouble was within me. I was tired and my mind was elsewhere. I had not prepared my heart to meet the challenge of working with a normal needy customer. I prayed that I would not feel impatient, but when I realized that my feelings weren’t going to change (because I was hungry and not well-rested) I just prayed that God would help me not cause this customer to have a bad experience. What wore me out the most was when she would apologize for not knowing how to do something—she was lost on the computer, and I was lost on the inside. For some reason it always bothers me when people apologize for not being able to do something that they just don’t know how to do…hearing those unnecessary apologies hurts me. Because their abilities are not inadequate, they’re just different. Upon breaking for lunch there was a watershed moment of self-sufficiency that saw its way through to the completion of a résumé. Hours of toil resulted in documented evidence of empowerment. Wednesday I stayed home because my son, Desmond, was sick (this was the day that he shared his fiery luncheon prayer). When I returned to work on Thursday I sat down in my cubicle and tears began to flow. I felt torn up inside and I still wanted to be home with Des. I once again felt unprepared to start the day. I lifted my head out of my Kleenex and saw flowers sitting on my desk inside a Taco Bell cup (which is clever as some of my friends would know). I didn’t ask where they came from. I just assumed someone in the office knew I was having a tough time and sat them on my desk. The cup said “LIVE MÁS” I thought that was an excellent challenge. 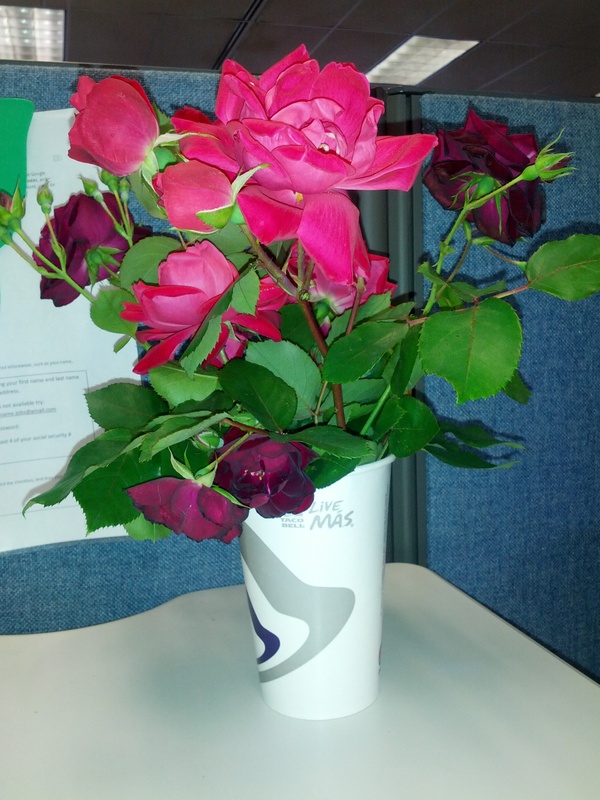 Later in the day, I asked a co-worker who had left me flowers. I was told that they were brought in by a customer…a customer that I had spent a significant amount of time with on Tuesday…a customer that required a lot of assistance…a customer that had worn me out just two days before. God sends flowers. Kittens are born. Rainbows color the sky.